Thanks To Paul Clatcher for the following information. 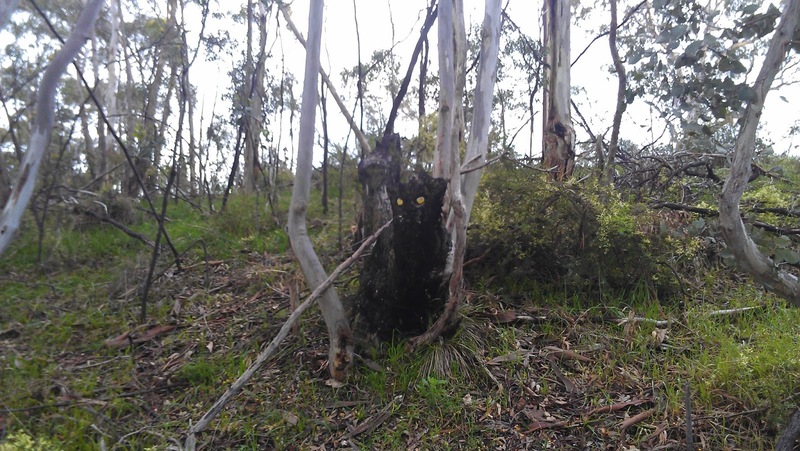 On Saturday 28/8/10 we were driving past Anstey's Hill National Park near Tea Tree Gully SA and I saw a large black cat sitting in the scrub. This was the hugest cat I've ever seen outside of a zoo. It WAS a panther I am certain of it. I have always loved big cats and I am sure this was no feral or wild cat unless it has been on steroids! I am determined to find it. I usually take hikes up these tracks regularly, it is one of my favourite places in Adelaide but I refuse to take my border collie up now because this BIG cat would have her for breakfast. I am currently putting together a search party to go and look for it. If you have any advice for tracking and finding it, it would be greatly appreciated. Thanx. And thanks to Daniel P for alerting Paul and giving me permission to use the following text and his photo of the "hilarious" big cat hoax. I live at Anstey’s hill in south Australia, I think the panther sighting was a well-orchestrated hoax as this morning we spotted the black panther overlooking the road through the scrub and went and investigated it. Attached are the photos of the stump with eyes painted on it. They did do a pretty good job of it and positioned it on a sharp bend where no cars can stop for further investigation without causing a collision on the narrow windy road.